Kuala Lumpur, the capital of Malaysia, is a sprawling metropolis where huge skyscrapers designed with architectural techniques at the cutting edge of modern design are sandwiched next to artisan coffee shops and boutiques. The city is built on the foundations of Chinese tin mines, and less than 200 years separate today’s imposing skyline from the thick jungle it was cut from. 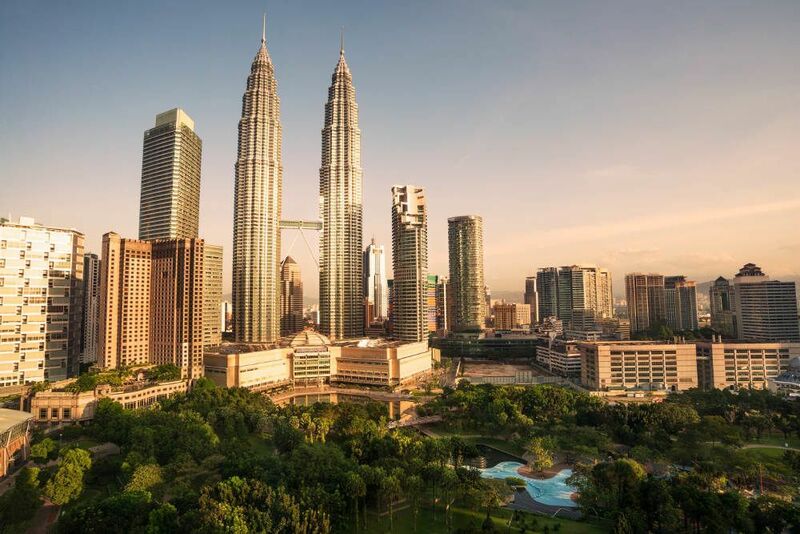 It is hot here, Kuala Lumpur’s tropical rainforest climate meaning the temperature rarely drops below 20 degrees centigrade, and the humidity stays solid at a brutal 80% year round. Locals put the frequent flooding and forest fires out of their mind with the city’s two main passions - shopping and food. The twin Petronas Towers dominate Kuala Lumpur’s skyline. Views from the 86th floor are unforgettable, but book early as half of the available tickets go in advance online. Though slightly smaller, most visitors prefer the view from Menara Kuala Lumpur, a 421m high telecommunications tower. At the top there is a revolving restaurant and weather-dependent open deck, which also has a terrifying glass sky box (those with vertigo need not apply). Follow more lofty pursuits at the Kuala Lumpur Forest Eco Park, a nature reserve with a canopy walkway that cuts through protected jungle right in the heart on the city. If your pleasures lie a little closer to ground level, take a trip just outside the city to the Batu Caves. This huge cavernous limestone complex has played host to pilgrims of Hinduism for most of the city’s history. Try not to spend so much time ogling at the ornate decorations of the shrines that you miss out on the Dark Cave and learning about the natural history of the area. To sample true traditional Malaysian cuisine, take a trip out to the jungle village of Sungai Penchala, where you can eat at Sambal Hijau and even learn to cook at LaZat, where a market tour is superseded by a cooking class in a traditional home. By far the best way to experience this vibrant city is on foot. None of those all-too-frequent traffic jams will get your goat as you explore Kuala Lumpur’s unique culture. Best of all, they’re free! Discover 11 important sites around Merdeka Square on this free guided tour. The walk lasts just under 3 hours. After sampling some of Kuala Lumpur’s rich history, you will take a trip through Chinatown where you will marvel at shops and markets selling everything you could ever want! Please note: Though this tour is free, it requires a fee of €2.50 when booking to cover the administrative costs of the booking system. Booking is also mandatory to ensure your place in the low group numbers. Airotour’s other option provides a unique view of the dazzling city after dark. The professional tour guides will show you the Bukit Betang area and the Petronas light show. Please note: this tour also carries the mandatory booking fee. Below you can find more popular (but not free) activities and tours in Kuala Lumpur. Are you from Kuala Lumpur and want to be a tour guide? Please get in touch by submitting your details on this page!